The Charles B. Wilson Professor and Chair of the Department of Neurosurgery, Director of The Tulane Center for Clinical Neurosciences, Tulane University School of Medicine, USA. Stroke is the fourth leading cause of death and the leading cause of disability in the United States. 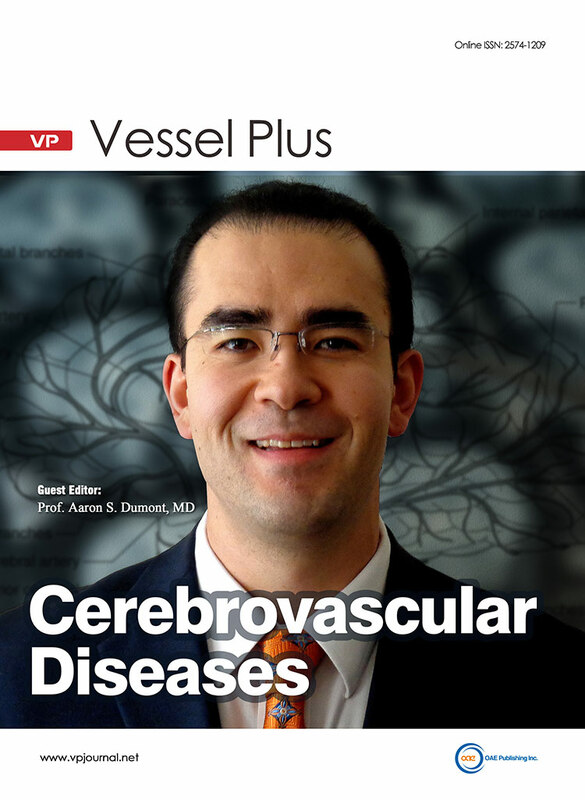 As both a common and devastating disease process, efforts focused on improving our understanding and treatment of cerebrovascular diseases are urgently needed. We are hereby soliciting manuscripts for this special issue dedicated to basic cerebrovascular biology as well as clinical and translational research focused on the diagnosis and treatment of cerebrovascular diseases including ischemic stroke, hemorrhagic stroke. Articles addressing acute ischemic intervention, stroke rehabilitation, cerebral aneurysms, cerebral vascular malformations, Moyamoya disease and extracranial and intracranial atherosclerotic disease are especially encouraged. Cerebral cavernous malformations (CCM) are manifested by microvascular lesions characterized by leaky endothelial cells with minimal intervening parenchyma predominantly in the central nervous system predisposed to hemorrhagic stroke, resulting in focal neurological defects. Till date, three proteins are implicated in this condition: CCM1 (KRIT1), CCM2 (MGC4607), and CCM3 (PDCD10). These multi-domain proteins form a protein complex via CCM2 that function as a docking site for the CCM signaling complex, which modulates many signaling pathways. Defects in the formation of this signaling complex have been shown to affect a wide range of cellular processes including cell-cell contact stability, vascular angiogenesis, oxidative damage protection and multiple biogenic events. 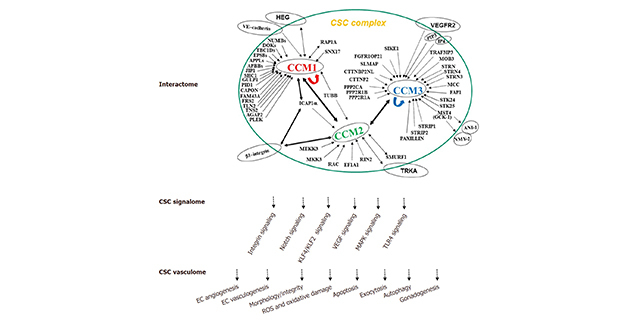 In this review we provide an update on recent advances in structure and function of these CCM proteins, especially focusing on the signaling cascades involved in CCM pathogenesis and the resultant CCM cellular phenotypes in the past decade. Aim: To determine whether plasmatic biomarkers correlate with 18fluoro-2-deoxy-D-glucose (FDG) positron emission tomography/computed tomography (PET-CT) and presence of microembolic signals (MES) detected by transcranial Doppler in patients with carotid stenosis. Methods: 18FDG-PET-CT and MES detection was performed in consecutive patients with 50% to 99% symptomatic or asymptomatic carotid stenosis. Uptake index was defined by a target to background ratio (TBR) between maximum standardized uptake value of the carotid plaque and the average uptake of the jugular veins. The analysis of biomarkers included adhesion molecules [intercellular adhesion molecule (ICAM)-1, vascular cell adhesion molecule 1, P-selectin and E-selectin], interleukins (IL-1, IL-6), chemokines (RANTES, monocyte chemoattractant protein 1), cytokines (tumor necrosis factor α), matrix-metalloproteases (MMP), myeloperoxidase, and lipoprotein-associated phospholipase A2. Results: There were 54 symptomatic and 57 asymptomatic patients. TBR values were significantly higher in the symptomatic compared to the asymptomatic (median 2.1 vs. 1.8, P = 0.002) and in the MES positive (MES+) compared to the MES negative (MES-) group (MES+, n = 19, median 2.3 and MES-, n = 88, median 1.8, P = 0.01). The best threshold for TBR values was of 1.9. We found a significant correlation between higher 18FDG uptake (TBR ≥ 1.9) and the plasmatic levels of chemokine RANTES (P = 0.03) and higher levels of ICAM-1 in MES+ patients (P = 0.03). Interestingly MMP-2 levels were more important in patients with lower TBR values (P = 0.02) and MMP-3 and P-selectin in those who were MES- (respectively P = 0.001 and P = 0.009). Conclusion: In the present study, ICAM-1 was associated with the presence of thrombotically active atherosclerotic plaques, while RANTES mainly correlated with the inflammatory process. MMP-2, MMP-3 and P-selectin levels were more important in patients with stable plaques. 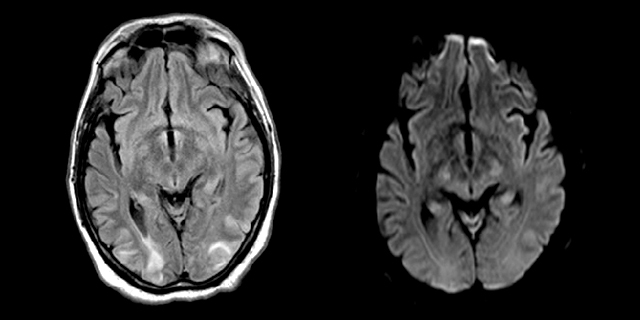 Posterior reversible encephalopathy syndrome (PRES) is an uncommon neurological syndrome due to autoregulation breakthrough with subsequent predominantly vasogenic oedemain associated with several clinical conditions. It is being increasingly reported in antineoplastic-treated patients. Here we report the case of a 72-year-old man who developed PRES during the second cycle of bortezomib treatment for multiple myeloma. Unlike usual PRES cases, only moderate hypertension was present at symptom onset, supporting the hypothesis that alterations of the vascular endothelium and blood-brain-barrier are the principal pathophysiological mechanisms involved in bortezomib-induced PRES. Prompt recognition of this potentially serious neurological adverse event is paramount to prevent mortality and long-term sequelae. Aim: The aim of the present study was to assess the 10-year cardiovascular disease (CVD) risk and to apply the current recommendations on aspirin use for primary prevention in Korean participants undergoing a medical check-up. Methods: Adults aged 50 to 69 years were eligible for the study if they did not have a history of atherosclerotic CVD (ASCVD) or stroke. The 10-year CVD risk was calculated using the ASCVD risk estimator (http://tools.acc.org/ASCVD-Risk-Estimator). Results: A total of 1125 participants were enrolled in this study. The mean age was 57 years, and 32% of the participants were women. Based on the 2016 US Preventive Services Task Force recommendations, aspirin was indicated in 266 (23.6%) participants but only 44 (3.9%) participants were taking aspirin regularly. Among these participants, aspirin was prescribed appropriately in 36% of the participants, suggesting that only 6% of the participants were taking aspirin appropriately and 3.3% of the participants were taking aspirin inappropriately. Logistic regression analysis showed that treatment for hypertension was significantly associated with taking aspirin (odds ratio 7.49; 95% confidence interval 3.62-15.49). Conclusion: Our study suggested that there may be an opportunity for decreasing the rate of CVD as well as the risk for major bleeds through tailored education on aspirin use.